Estonian Public Broadcast (Eesti Rahvusringh?_ling, ERR) has chosen Riedel Communications to provide comms for its new 16 camera HD OB van. 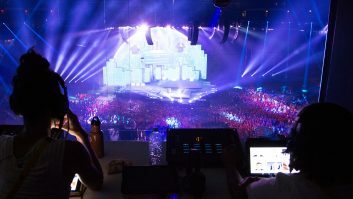 The German specialist in intercom and fibre technology delivered a comprehensive communications solution consisting of an Artist intercom and Motorola professional radios. The new ERR truck was finished after nearly a year of construction. The intercom system is based on an Artist 128 digital matrix mainframe. COAX-108 and CAT5-108 client cards provide the connections to the control panels with BNC and RJ-45 connectors, respectively. MADI cards offer connections to the truck’s Lawo audio router. Six AIO-108 cards provide the necessary analogue audio I/Os. The installation consists of a total of 15 Artist control panels. Six 1000 series control panels and nine 2000 series control panels will be used in the truck. In addition, an Artist 1000 desktop panel will be used together with a CSX-11 commentator unit. Commentators will thus have full intercom and commentator audio capabilities directly on their panel with no additional cabling required for the audio. All control panels are connected to the matrix via either CAT-5 or COAX cabling and deliver digital AES/EBU broadcast quality audio. An ASM-G2 sync module ensures jitter-free audio transmission when connecting various digital audio sources to the system. “We are very pleased with this HD truck and its one-of-a-kind technology for the Baltic region. The Artist solution from Riedel provides excellent voice quality with superior reliability. The audio quality of the Artist intercom matrix even allows us to distribute commentator audio and analogue audio signals in digital broadcast quality audio through the intercom system,” said Sander _ksk_la, R&D manager TV production technology at ERR. The Baltic system integrator Hannu Pro was responsible for the installation in conjunction with Grass Valley, beating nine other competitors for the project.